Preaching, in one sense, merely discharges the firearm that God has loaded in the silent place. Yesterday I wrote about the concept of seeking prayer support and prayer cover for the ministry that we are involved in. As vital as that is, it can never be a substitute for personal, private prayer. I am a little sad at the changing of the season, because this summer I have grown to love an outdoor location nearby where I can go and pray, and dream, and think, and pray some more. Perhaps it will still work without leaves and with rain, we’ll see. 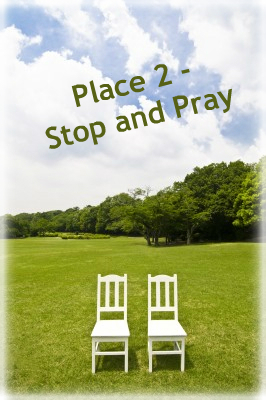 It is important to find a way, a place, a time, for regular uninterrupted communing with the Lord. A time to dream together about the future, to think together about the present, to weep together, to worship together, to be together with Him. I remember the comment of one faculty member at the seminary I attended concerning another – he is a real man of prayer. I’m not sure how that could be known, but actually it does show, doesn’t it? In three or four decades time I hope people might say that about me . . . but for that to happen I need to be a man of prayer now. What can we give up to free up time for prayer? What else has the same sense of weightiness as fellowship with our Lord? Personal, private prayer. Nothing else comes close. Is there any inconsistency between what we say and what we practice in regard to prayer and preaching? If we, as preachers, genuinely believe that our preaching is dependent for its power not on technique, ability, skill, etc., but rather on the power of God Himself. If we, as preachers, are aware of the spiritual battle that rages among believers and not-yet-believers during the weekly routine of church life. If we, as preachers, are aware of our own struggles and weaknesses in the complex experience of life and ministry. Well . . . shouldn’t the pursuit of prayer for the ministry be paramount in our many lists of priorities? Do we diligently seek out prayer partners and ask them to stand with us? Not because we are somehow special individuals, but because the ministry we are involved in is itself a special task for which we are inadequate? Do we express to our listeners our need for prayer, or do we give the impression, even inadvertently, that we have it all together? And finally, what about intercessory prayer meetings before and during and after the preaching of the Word? In some circles this is standard practice. In others it is unheard of. Why? If it is a spiritual battle, if it is by God’s strength alone, if it is a task too great for us to handle in our strength, then why not? As I look back on last Sunday’s ministry, perhaps my greatest regret is that I didn’t request a simultaneous prayer gathering – even just two or three people praying for those listening, for the one speaking, for God’s power in it all. 1. Prayer. Prayer is not a short-cut. It is a necessity. It is critical. However, it is not a short-cut. In fact, praying in preparation will probably make the preparation take longer, but it is worth the longer journey. Many preachers think that all they need to do is pray and then preach their impressions. This is neither pleasing to the Lord nor helpful for the listeners. Why do some preachers think God is so pleased when they essentially dismiss the Bible by skirting around the study process in preparation? I suspect that if we pray “Lord, please show me what I should say from this text!” that His answer would include “I want you to say what the text says.” God takes His Word very seriously, so should we, and prayer is not short-cut around the blessing of spending significant time and effort wrestling with the true and exact meaning of the passage. Tomorrow I will add another short-cut that is not worth taking if we are to be Biblical Preachers! Consider what must be sacrificed in order to take genuinely focused time in prayer this week. Don’t leave prayer until your message is prepared. Don’t leave prayer until the unplanned needs are addressed. Don’t leave prayer until your next day off. Don’t even leave prayer until it can be used to “redeem the time” in the car journey between appointments. “Refuse to believe that the daily hours Luther and Wesley and Brainerd and Judson spent in prayer are idealistic dreams of another era.” – Page 57.